Samsung Galaxy S users see a lot drama surrounding its Ice Cream Sandwich update. After so many official news are now confirmed that it won’t see Android 4.0 in its lifetime, at least not from Samsung. But there is no confusion about Samsung Galaxy S II and its ICS update. Samsung guys are working hard to the new Android 4.0 with their TouchWiz UI for the i9100 Galaxy S II. Proofs for this are two official Samsung Galaxy S II Android 4.0 ROMs that have leaked. The two versions are I9100XXKP4/OXAKP4 and I9100XXKP8 / OXAKP8 based on Android 4.0.1 and Android 4.0.3, respectively. SamMobile.com is reporting that while both are early alpha versions of the final update supposed to hit all Galaxy S II devices early in 2012. The more stable one is the latter. 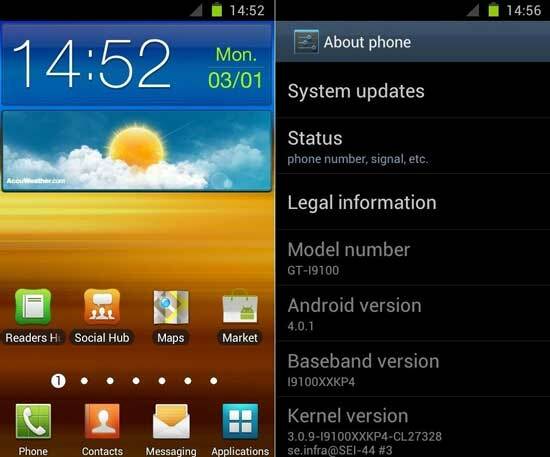 There are many screenshots of how the Ice Cream Sandwich with TouchWiz update looks on the S II are also leaked. If you simply can't wait any more for Samsung to release the final ICS update for your Galaxy S II, then jump to the source links below for full instructions on how to get the updates now.